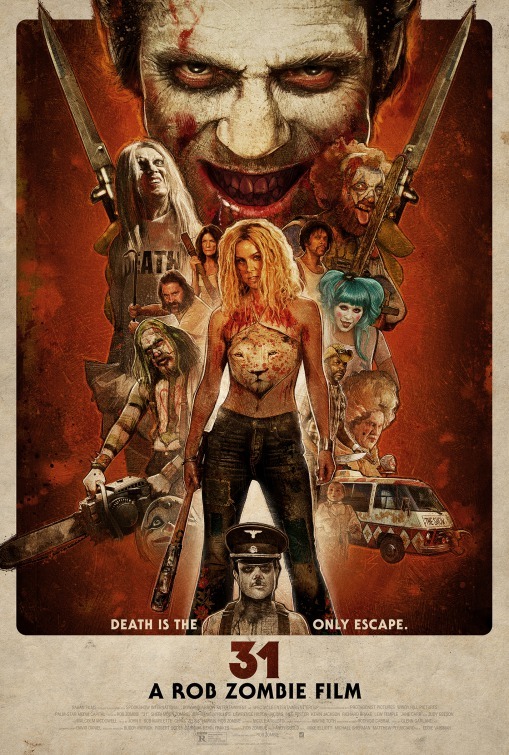 Tag line: "Welcome To Hell"
Rob Zombie may not be every horror aficionado’s cup of tea, but I’m an unapologetic fan of his films. His first two efforts, House of 1,000 Corpses and The Devil’s Rejects, were tremendous (I watch both every single October), and while his Halloween updates had their problems, they were, in the end, decent slasher flicks. Even Lords of Salem featured a handful of creepy moments, and I’m hoping I get a chance to revisit this 2012 movie in the near future. Unfortunately, the writer / director’s newest film, 2016’s 31, was a major disappointment, and is, to date, the worst he’s made. October 31st, 1976. 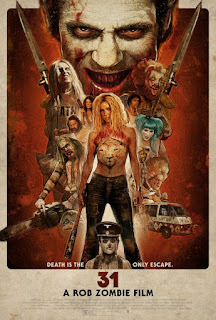 Five carnival workers: Charly (Sheri Moon Zombie), Roscoe (Jeff Daniel Phillips), Panda (Laurence Hilton-Jacobs), Venus (Meg Foster) and Levon (Kevin Jackson), are abducted and taken to a remote warehouse, where they’re forced to participate in a life-or-death contest known as “31”. With Father Murder (Malcolm McDowell) acting as emcee, the five are released inside the warehouse and hunted by a variety of maniacal killers, all wearing clown make-up. In 12 hours, those left alive will be set free, but with the homicidal Doom Head (Richard Brake) hot on their trail, the odds aren’t looking good that Charly or any of her friends will survive this terrifying ordeal. 31 is, in every way, a Rob Zombie horror film (foul-mouthed characters, a ‘70s setting, and good period music such as Steven Tyler’s "Dream On" and "California Dreamin’" by the Mamas and the Papas), and I really liked the opening scene (a priest, played by Daniel Roebuck, is tied to a chair, and is taunted by Doom Head). Mind you, it’s not the best pre-title sequence Zombie ever created (he has a long way to go to top the intro to House of 1,000 Corpses), but it definitely piqued my interest, leaving me anxious to see where the movie would go from there. 31 also has a terrific cast, including Laurence Hilton-Jacobs (whose "Boom-Boom" Washington was my 2nd favorite Sweathog in the ‘70s show Welcome Back Kotter, just behind Ron Palillo’s Horseshack) and Meg Foster (the gorgeous, blue-eyed bombshell of They Live and Carny fame). And while a good many people have taken issue with it, I have no problem whatsoever with Zombie casting his wife, Shari Moon-Zombie, as the lead in his films; cinema’s long, rich history is full of such actress – director relationships (Marlene Dietrich and Josef Von Sternberg; Greta Garbo and Clarence Brown), and Moon-Zombie does a fine enough job in 31 to justify her inclusion. In addition, Richard Brake gives a magnetic performance as Doom Head, who, despite being a typical Rob Zombie character, still had a few surprises hidden up his sleeve. That said, 31 should be the last time that Zombie and Malcolm McDowell collaborate on a movie, because the pairing is not working for either one of them (McDowell was ineffective in both Halloweens, and brings nothing at all to this film). But truth be told, neither Moon-Zombie nor McDowell, or indeed any of the actors, are the weakest link in this particular movie. The issue here is that, for a “stalk and slash” motion picture, 31 generates zero tension throughout. I mean none. There wasn’t a moment during the entire film when I was on the edge of my seat (instead of keeping us in suspense, Zombie simply parades out a new killer every few scenes and turns them loose on his main characters). Also, aside from Doom Head, the collection of killers was pretty weak (Sick Head, a Nazi midget portrayed by Pancho Moler. was interesting at first, but ultimately talked a better game than he played). Even more disheartening was that, unlike Zombie’s earlier films, 31 was, at times, kinda predictable (I, and I’m sure a good many others, knew what the payoff of the dinner scene was going to be well before it was over). Though I was disappointed with 31, I still want Rob Zombie to continue making horror movies; all things considered, his track record in the genre remains impressive. I just hope he gives us something better next time out. Like yourself I'm a fan of Rob Zombies movies but I was disappointed with 31. I felt at times it was a bit of a mess with far to much shaken camera going on. Fingers crossed he gets back on wining form soon. I'm in the same camp of Zombie fan. 31 to me is perfectly OK, but nothing more. It's a good movie to have as background, but doesn't capture your attention. House of 1000 corpses is my favorite of the Zombie flicks. I have no issue with Sherri in this one. She is good in certain roles. I wanted to like Lords of Salem, but ultimately didn't. I watch House of 1000 Corpses about every other month. This one I watch on occasion. It works so much better as a backdrop to a party than it does as a main event. Mute the movie, play some industrial music, grab some drinks and friends. That's the way to enjoy 31.